MLK Day was no holiday on the police headquarters construction site. 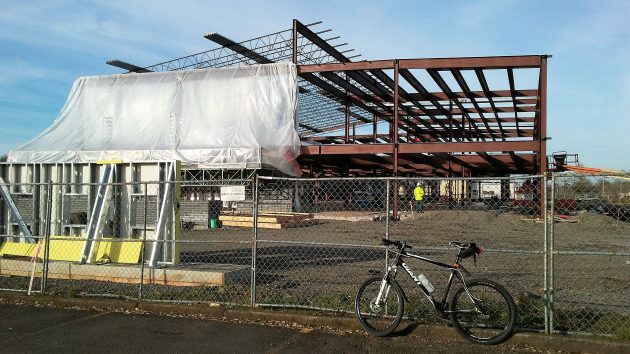 There’s no apparent connection, but as Albany is building its new police department headquarters, serious property crime in the city seems to have taken a substantial drop. I stopped by the construction site at 2600 Pacific Blvd. S.W. on a ride Monday, Martin Luther King Day, before the rain that was forecast for this week had a chance to start. (Even though it’s a government project, the crew was working on that holiday.) One thing I had not noticed before is that the back part of the two-story building will have a slanted roof. Smart design, if you ask me, in a town that gets 40-plus inches of rain a year, most of it in winter. Then on Tuesday, the police department emailed its quarterly report to the community. Among other items of note, there’s a table showing that property crime in Albany declined 14 percent from 2015 to 2016. The table, I learned Wednesday morning, covered only the first 11 months of each year. For the full year, the decline was 12 percent. Both business and residential burglaries went down from year to year. The biggest drop, though, 24 percent according to the updated table I got this morning, came in thefts from vehicles. There were 402 such crimes in 2015, and last year the number was down to 304. The police keep telling people to lock their cars and not leave stuff inside, so perhaps this advice has finally begun to sink in. No such decline, though, took place in reports of thefts of entire vehicles, which happened 110 times in 2015 and went up to 113 last year. Violent crime in Albany, while relatively rare, stayed pretty much the same from year to year, sad to say. Only robberies spiked 31 percent, with 21 incidents in 2016. The overall drop in serious or “Part 1” crimes, according to Chief Mario Lattanzio, probably puts Albany at or below the average Oregon crime rate. And considering how much above average Albany had been in property crimes before, that’s a big deal. I wonder if the drop in crime has anything to do with how cold it is out there. This downward trend in Albany’s crime rate has any number of tangential correlations. In spite of the City Council’s dictatorial propensities vis a vis marijuana sales inside city limits, wherein those who objected to the citing of pot shops asked citizens to believe that pot heads and pot sales would drive criminality into the stratosphere. Yet we see exactly the opposite. And to all those residents who complained the new Cop Shop is overly extravagant and unnecessary, perhaps those folks ought to consider that just maybe the idea of a new, massive Police HQ going up serves as a deterrent of sorts for those who would violate our sensibilities. Our hats are off to the new Police Building. It seems to be having the desired effect. It may be a “government project,” but it’s not being built by government employees. Intrepid workers from private enterprise are the ones who were working on Monday. They and their employers are very much aware of what profit, cost, and schedule mean. Gentrification – Bottom line, it’s costing more to live in Albany. As additional premium services come on line, the more affluent will flock to the city. Crime and Poverty will naturally be transferred to other areas. Not to mention the huge amount of capital coming into the state from those south of here. On a macro scale, police are just along for the ride although the targeting of petty property crime, as they are currently concentrating on, does make an impact on what crime exists. As it does in every city that is growing and improving. If a city has it’s cost of living continually decline, it is a seriously failing city IMO. I hope this isn’t the case, but sometimes people just give up reporting property crime because it doesn’t do any good. I had a nearly new lawn mower stolen from my late brothers house about 20 years ago, and when I went to the station, I was treated rather rudely and given the ATTITUDE that they have “important” matters to deal with. A couple years ago, I had a bicycle stolen out of my garage and actually had an officer come out and take a report AND she actually seemed to care! I am sorry to have to agree with Bill here. We also had a theft incident a few years ago. It was blatant, it was clear, we had clear video evidence and recorded proof of who the culprit was and what was stolen. When we reported it to the police, they also said that they were not going to do anything about it. They were very discourteous and unprofessional to my wife. It sure discouraged me from expecting any action on property crimes or theft of a small scale. In the end, we hired a lawyer, and were able to use the evidence ourselves in a court of law to gain some satisfaction. But this was all done without the help of our local police. It has to be a pretty major crime, or something that I believe they would take immediate action upon for us to contact the police now. Small scale theft does not rise to that level. While the Albany PD is no doubt doing a fine job, it is possible that the decline in theft from autos has nothing to do with them. It’s possible (maybe probable) that the decline is due to the ease of locking our cars with those handy-dandy little key fob electronic locks. Most autos these days come with them as standard equipment and they make the ease and speed of locking all doors at the same time with the push of a button so easy and quick that it takes no time or effort to do so. Thank you private enterprise and inventiveness for producing same. Capitalism at its best!